Assam is the home of several types of silks, the most prominent and prestigious being muga, the golden silk found exclusively in this state. Muga apart, there is pat and eri or endi, the latter being used in manufacture of warm clothes for winter. The silk commonly found in Assam is non-mulberry silk. Pat which is mulberry silk is found in small quantities. Endi is yellowish in colour and is found in rough and smooth varieties; it derives its name from the castor leaves on which the worm feeds. This is woven, into shawls and clothing for the winter. There are two types of muga silk, depending on the leaves the worms feed upon: champa adakari and mejamkari. 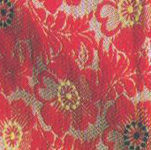 Muga silk has a golden sheen and is in high demand all over India for embroidery purposes. It grows more lustrous with each wash. This was used, together with zari, to weave fabrics for royalty. Today, the zari has been replaced by multicoloured cotton threads. 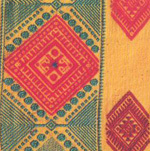 The designs woven into these fabrics are drawn from the flora of Assam and, as in other parts of India, are symbolic of the different tribes and ethnic groups of the area. The main centre in Assam for silk-weaving is Sualkuchi. The texture is delicate, with dainty designs and natural colours. The main dress of the women here is the lungi called mekhela. This is usually plain but sometimes has motifs all over its body and can have elaborately designed ends. The other items of clothing include the chaddar, which goes over the shoulder, and the riha, which is tied to the waist. The motifs are usually flowers, birds, animals, leaves, and geometrical designs. 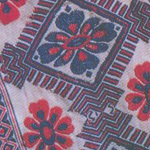 One speciality of this region is the bamboo weft designs, eight in number, which are used as variations in weaving patterns.